Rejuvenate hair with the Hydration Support Conditioner from hif (Hair is Fabric). 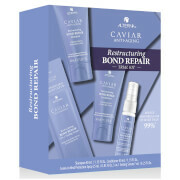 Its unique formula contains low-molecular weight hyaluronic acid to hydrate the hair and scalp and leave it silky soft. The moisturizing conditioner prevents dandruff formation and strengthens to give locks a thicker and fuller feel with a healthy-looking shine. E.N. Work into wet hair. Leave on for 3 minutes, then rinse. Aqua (Water), Parfum (Fragrance), Cetyl Alcohol, Propanediol, Stearyl Alcohol, Glycol Distearate, Behentrimonium Chloride, Polysorbate 60, Hydroxyethylcellulose, Hydrolyzed Keratin, Sodium Hyaluronate Crosspolymer, Tremella Fuciformis Sporocarp Extract, Tocopheryl Acetate, Acacia Senegal Gum, Panthenol, Xanthan Gum, Isopropyl Alcohol, Glycerin, Betaine, Lecithin, Ethylhexylglycerin, Pentylene Glycol, Linoleamidopropyl PG-Dimonium Chloride Phosphate, Propylene Glycol, Potassium Sorbate, Carrageenan, Chlorphenesin, Phenoxyethanol, Alpha-Isomethyl Ionone, Benzyl Alcohol, Benzyl Benzoate, Benzyl Salicylate, Citral, Citronellol, Coumarin, Eugenol, Farnesol, Geraniol, Hydroxycitronellal, Isoeugenol, Limonene, Linalool.